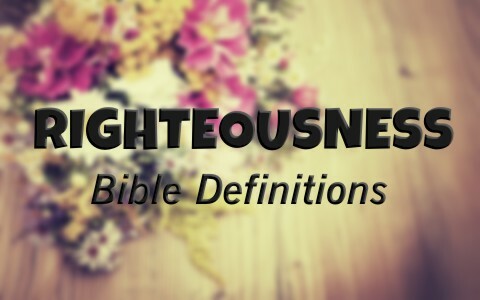 How Does the Bible Define Righteousness? During a time when surfer lingo was popular (think about the turtle in the movie Finding Nemo), the word righteous was often used to indicate approval or something good. For example, if someone surfed a big powerful wave all the way to the shore, their extremely difficult ride might have been described as gnarly in practice, but righteous in overall approval. Other than Jesus walking on water, you will not find anything close to surfing in the Bible. However, if you take a moment to learn how does the Bible define righteousness, you will find that it is much easier than riding a big wave. Purity of heart and rectitude of life; conformity of heart and life to the divine law. Righteousness as used in Scripture and theology, in which it is chiefly used, is nearly equivalent to holiness, comprehending holy principles and affections of heart, and conformity of life to the divine law. It includes all we call justice, honesty and virtue, with holy affections; in short, it is true religion. Applied to God, the perfection or holiness of his nature; exact rectitude; faithfulness. The active and passive obedience of Christ, by which the law of God is fulfilled. Daniel 9:7. Justice; equity between man and man. Luke 1:75. The cause of our justification. The Lord our righteousness Jeremiah 23:6. We can see that in the Webster’s 1828 definition, there is an emphasis on holiness in principles and affections of the heart through conformity to divine law. Despite some listed Bible verses, what is missing is how one attains righteousness? After these things the word of the LORD came unto Abram in a vision, saying, Fear not, Abram: I am thy shield, and thy exceeding great reward. And Abram said, Lord GOD, what wilt thou give me, seeing I go childless, and the steward of my house is this Eliezer of Damascus? And Abram said, Behold, to me thou hast given no seed: and, lo, one born in my house is mine heir. And, behold, the word of the LORD came unto him, saying, This shall not be thine heir; but he that shall come forth out of thine own bowels shall be thine heir. And he brought him forth abroad, and said, look now toward heaven, and tell the stars, if thou be able to number them: and he said unto him, So shall thy seed be. And he believed in the LORD; and he counted it to him for righteousness. (Genesis 15:1-6). We see that Abraham found righteousness, not by his works, but by faith in what God had said to him as referenced by the words, “Abraham believed God and it was accounted to him for righteousness.” It goes on to explain that Abraham did the works he did, not to merit God’s grace, but because of God’s grace. Abraham did them out of a debt to God for what God did in giving Abraham grace. Abraham did them out of love of God, because God loved him first (1 John 4:19). Finally, we see that through Abraham’s belief, God justified him and counted Abraham’s faith for righteousness. Simply stated, Abraham’s righteousness had nothing to do with his works. It goes on to quote David’s mention of how a man is blessed when God imputes, or credits to his account, righteousness without work. This results in a man’s iniquities being forgiven and his sins covered. God does not impute, or account, man’s sin to him. When his sins are not imputed to him, then man is not subject to the wages of sin, which are death. By God’s grace are we saved, through faith, not of our works, which leaves us no claim on having any righteousness from our own merits (Romans 6:23; Ephesians 2:8-9; James 1:13-18). The term righteous is commonly referred to as something that you believe is morally right or fair. Given man’s varying opinion about what is morally right or fair, righteousness can have a wide range of definitions. The Bible teaches that righteousness is based on what God says about what makes us right in His eyes. What makes us right or righteous in God’s eyes is not anything that we have done. It is our response to His grace by believing through faith that what God has told us about salvation through His Son, Jesus Christ is true. Resources – Scripture quotations are from The Holy Bible, King James Version. “Righteous.” Merriam-Webster.com. Merriam-Webster, n.d. Web. 25 Oct. 2016. Retrieved from www.merriam-webster.com/dictionary/righteousness. Webster, Noah (1828) ”Righteousness”. Webster’s Revised Unabridged Dictionary (1828): American Dictionary of the English Language. Next post: Is It Possible That God Created Life On Other Planets?